My name is Elsie Taveras and I am thrilled to be serving as the Executive Director of the Kraft Center for Community Health! In June 2017, the Kraft Center celebrated its fifth anniversary and its work to date geared towards developing a new generation of physician and nurse leaders committed to careers in community health. We extend a warm thank you to Dr. Derri Shtasel and Harriet Tolpin who led us through the first chapter of the Kraft Center’s ongoing and powerful story. As we look to the next five years and beyond, we are excited to move our organizational home from Partners HealthCare to Massachusetts General Hospital (MGH) Community Health. The Center is administratively overseen by Joan Quinlan, our vice president of community health. A little bit about me: I came to MGH a little over four years ago to be the chief of the Division of General Academic Pediatrics at MassGeneral Hospital for Children. 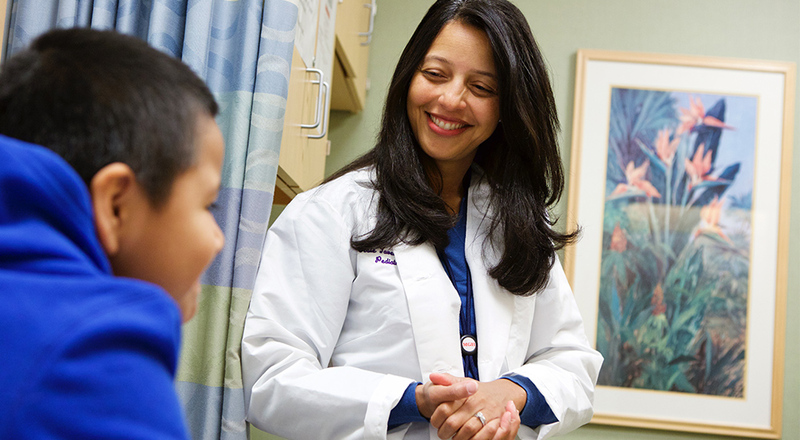 I am a board certified pediatrician, Professor of Pediatrics at Harvard Medical School and my passion is developing clinical-community programs that improve the health of children and families while reducing health disparities. I have focused my career on developing and testing programs across the lifecourse to prevent poor health outcomes, especially in underserved populations. The mission of the Kraft Center aligns with my own beliefs and experiences and I look forward to working with you all to continue this mission over the coming years. The mission of the center will remain the same, and will be focused on improving health and health care for disadvantaged populations. Over the next few years, we will shift our programs and approaches to deliver more direct services to address some of our most pressing community and population health challenges. Chief among these are the opioid epidemic facing the nation and tackling the social determinants that lead to inequalities in cancer care. We will also continue to look for ways to promote leadership and training in community health, particularly for underrepresented minority students and those committed to serving medically underserved communities. While we are working to develop our portfolio of programs, we hope that we can continue to count on the Kraft Center alumni and our community of partners to further the agenda of the center. Stay tuned for exciting announcements, and please don’t hesitate to contact me with thoughts or questions!